I hope all of my readers will follow the link! You’ll be amazed at what Stinky can do! 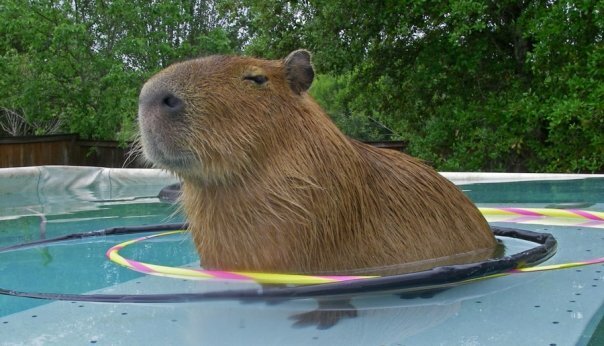 He is quite a capybara. This has also given me some ideas on things to train Garibaldi Rous to do. Right now we are working on picking up a stick in his mouth and that is slow gowing, but afterward I think Gari would look cute on that seesaw ramp! First of all I´m sorry for my bad English but I´ll give a try. Stinky is 2 years 10 months and 10 days old (his birthday is on 26th march 2011). I came to the zoo on 3 April, 2012 and immediately fell in love with him. I didn’t give him his name. He got that name because his mother didn’t want to take care of him (often occurrence in wild), so they brought Stinky up on the bottle. Yes, he is neutered. About his size, he is small because he was withered. He was at least two time on the verge of death (they told me so). About his name: they gave him that name because while ´´feeding in the bottle period´´ he spent a lot of time in a cage. But every being kept in a cage gets smelly because of urine.) Otherwise of course, he doesn’t smell. Maybe it would sound a little bit odd, but I like his scent (I´m sure you understand me). For one year I was a volunteer (unemployed). Now they have employed me for one year. What will be after April, I don´t know. I love him so much, he means everything to me. He has a little swimming pool (well, a basin filled with water). In the summer he spends a lot of time in the water (wallowing). It is so funny! 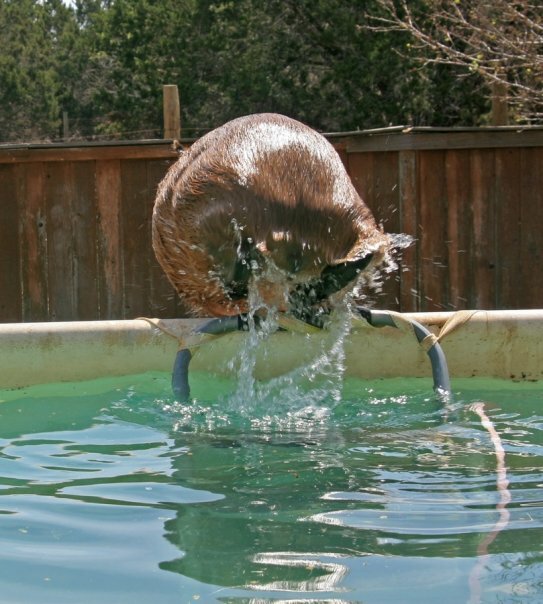 Sometimes he runs and jumps in the water. Of course now when is cold, he doesn’t like to swim. He would rather stay inside his very little house. When I say little it´s very small place filled with hay and straw. And he has heating light. Now when it is cold he goes very often on toilet in his little mansion, so I clean place three times a day. One of the best things is when he goes to sleep he lies with his head in your palm and with your other hand you can stroke him. This is so priceless. I take care of him. Every day I am with him. In the days, when I´m working, I am always with him before working time. when I have time for lunch I am with him. and after work. I train him in my free time, so what we do is not official. I hate this time of year because days are so short and we both hate snow, hehe. Around his house the snow is already shoveled. now the field where we usual train needs to be shoveled. In the spring/summer/autumn it was great to bring him a lot of fresh grass (he specially loves dandelions). Otherwise he gets pellets, vegetables (he specially likes bitter ones like chicory, endive,..) and very little fruit. I don´t give him a lot of fruit, because I don’t want him to get diabetes. He specially loves blueberries (Americans), mandarins, banana and of course apple for training. Oh, and his fur in the summer is like reddish brown. About training, i just started doing it. I took it very seriously. 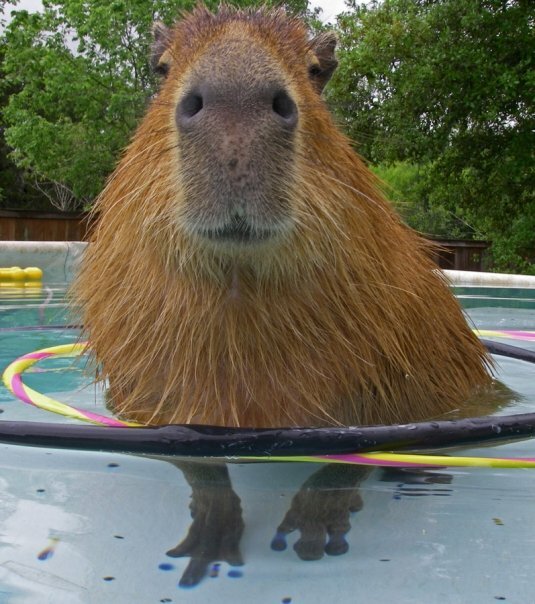 For me, capybaras are very, very intelligent animals. Training is the same as with dogs. We could do primary dog school. In one day he got to know what clicker means. Even though I use the clicker all the time, we are able to do training without it. he knows the ˝order˝ (verbal command) for each trick. He is so smart! As a treat I use pieces of apple. I only trained our family dog. This is the only experience that I have with animal training. I manage to do all the obstacles in December, so now it can be said that we are doing agility. Before that we just did tricks: to sit, to lie down, to shake hands (Either one, you choose if you want left or right), to go around you (for example you can combine some tricks: like in dog school when you call him he comes and than you say to sit or to lie down and then go around. He can walk beside you and than to stop. He knows the meaning of the words beside and stop. He does eights (going in either direction), walking between legs, turning 360 degrees on rear foot, going backward on his back foot.Oh, we went once through the door that leads from the enclosure, but he didn’t like it. It was like he came in the another world.Of course I have seen your movies on you tube, but I couldn’t tell you anything sooner because you wouldn’t have believe me. I couldn’t publish anything on my own before now that is published on internet. (he unfortunately is not my animal).I would really like to put video on you tube or whatever but I don´t have a clip. 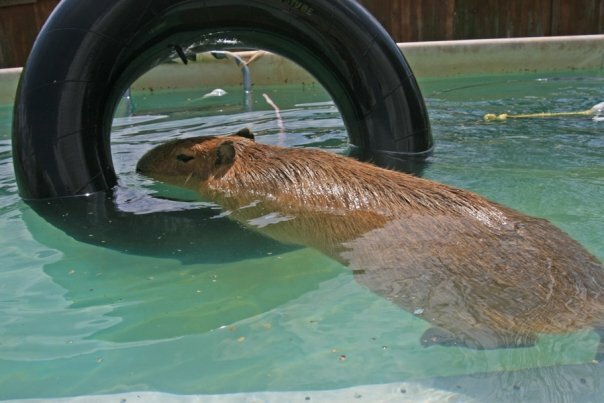 So I would be more than grateful if you could mention to people that love capybaras, that capybaras are able to do agility. Thank you. 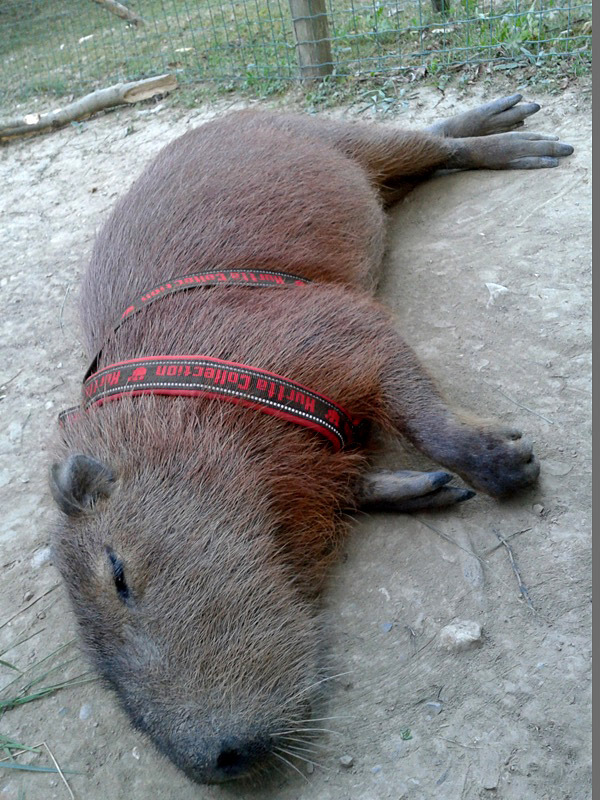 I often hear that capybaras are lazy and stupid and so one and one. I am so angry and sad because of that. 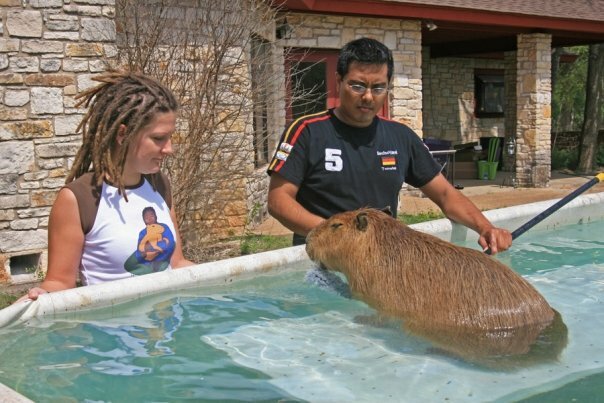 I wish that people would see capybaras as very inteligent, special beings not a meal on a plate. I am vegetarian by the way. Stinky is the best that happened to me. I love him so much. 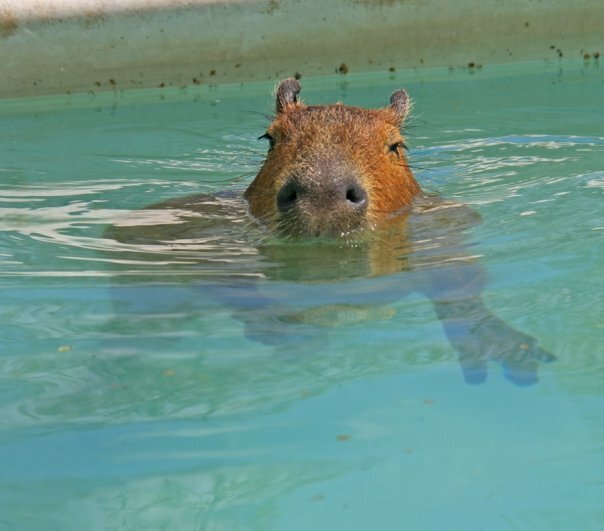 Capybaras are the king of the animals. You sure understand me. I just wish to have him 24/7 by my side…nothing else, nothing else matters. I would definitely like to stay in contact. Give a Garibaldi a huge hug. This is absolutely wonderful! I can relate to how Simon has fallen in love and is obsessed with this beautiful creature. I cannot explain it to people but I feel the same way. 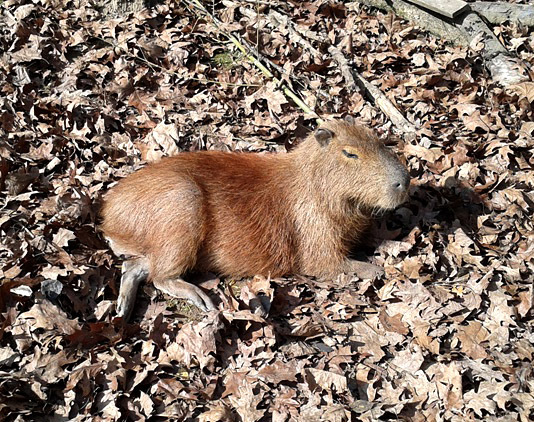 I know I could not have one as a pet (it would be unfair for the capy) and unfortunately I do not currently have the ability to visit one at this time. 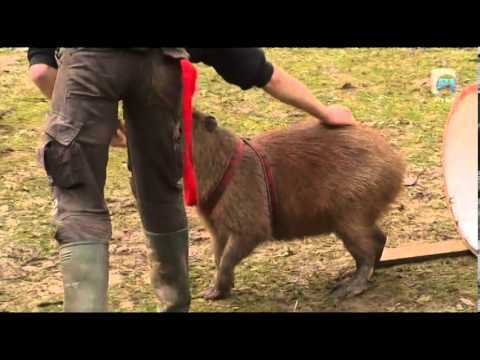 I hope Simon continues to be able to share this wonderful companionship with his capy. I would love it if he is able to continue to share his adventures with us. Thanks for sharing Melly. This is exciting and I’m looking forward to what new adventures this agility training might put forward for you and Gari. Once again for sharing with us! What a wonderful account of Stinky. He is lucky to have such a devoted ‘friend’ like Simon. I loved reading this!! Simon obviously loves Stinky (I had a Bassett Hound named Stinky when I was a child, so that is awesome!). 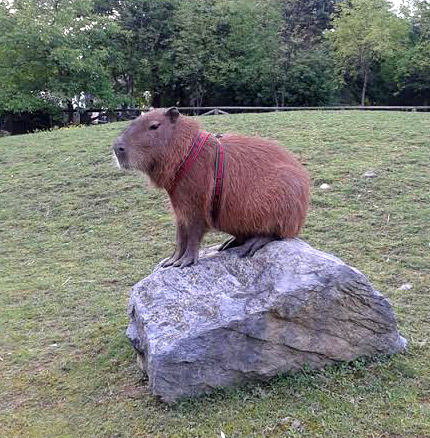 I’ve seen capybaras at zoos before, and I think they are very intelligent animals as well. I am so glad that someone is showing Stinky the love and respect he deserves. Good luck to you and Gari on the training! Oh, how I understand Simon! What a wonderful guy he is. I hope their friendship will be long and happy. Melanie, thank you so much for sharing Stinky! He’s wonderful and very lucky to have Simon, just like Gari is lucky to have you. Hope you are well. I found the video on youtube and it played perfectly. Stinky starts around 15:40. What a wonderful story! Simon is a very special person. I hope we get to hear more about him and Stinky! How great that he was able to reach out to you so that we could learn about him. I think Melly and Simon are definitely kindred spirits in capy love! I hope he gets to stay at the zoo and spend time with his friend. Wow! What a wonderful story! Thank you so much for sharing! 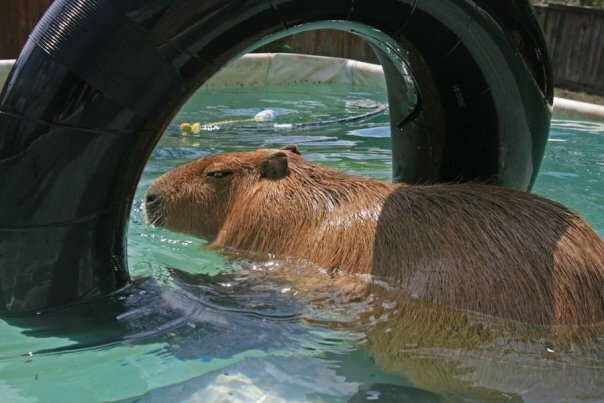 I was just at the San Diego Zoo and had an opportunity to observe the Capybaras there. 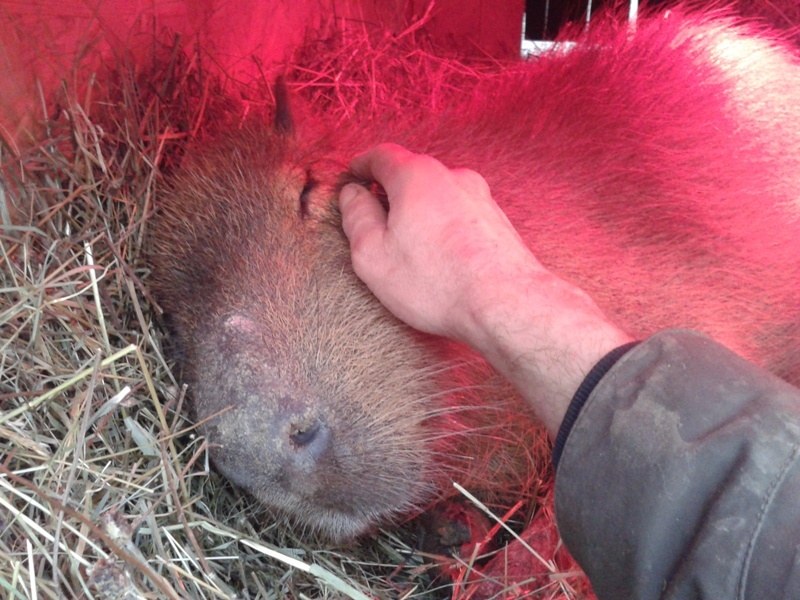 Oh, I just loved that vid – agility in Capy-Time.☺️ What a fortunate boy Stinky I’d, to have Simon to love him so. I hope Simon continues to give us updates! That is the most inspiring video I have ever seen! I can sit, stand up, turn a circle, give Stacy a kiss, lie down, roll onto my side, and wave bye-bye. I want to get a barrel to walk through, but that teeter-totter looks scary! I will be able to jump a hurdle, too! That looks fun! My best trick is getting pouffy but I can’t do it on command. Yet. You just wait! This is so fantastic! You can see how much Simon and Stinky love and respect each other. 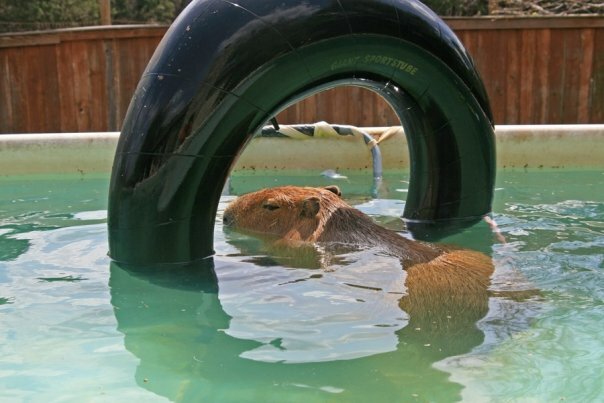 Capybaras are so much smarter than a lot of people give them credit for and Stinky proves it. Agility, grace, all that and they look great dressed to the nines. Great story! I’m so glad Simon shared his story. What a GREAT human Stinky has!